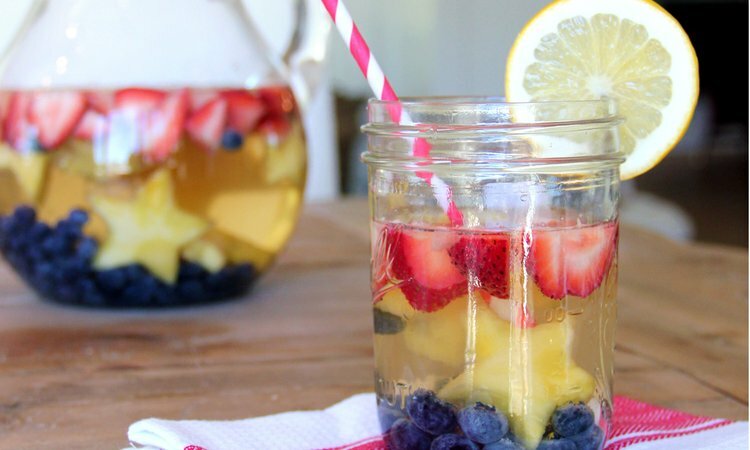 Healthy and Festive Drinks for the Fourth of July! Celebrating our nation’s independence inevitably calls for some celebratory drinks (and some yummy treats)! Want to get a little festive and stay a little healthy this Fourth of July weekend? Instead of filling-up on soda and beers (although one or two is ok); try one of these four delicious options! Some of the drinks are non-alcoholic, but for those over 21, feel free to spike with vodka or gin! Just as a heads up, some of the drinks require preparation so make sure to look at the ingredients and read the directions before Fourth of July morning! 1. Make the Ice Cubes: Place a couple raspberries and blueberries into each square of an ice cube tray and fill the tray with lemonade. Let the trays freeze overnight. 2. In a large pitcher, mix the lemonade and chilled soda water. Continue to chill. 3. When you’re ready to serve the cocktails, put a few berry ice cubes into a glass and fill the glass with the lemonade/ soda water mixture. 1. Place the strawberries, lemonade and ice in a blender. Mix until combined. 2. Wet the outside rim of each glass with lemon, honey, or water. 3. Open the packets of Pop Rocks onto a plate and leave aside. 4. Dip the wet rim of each glass into the Pop Rocks on the plate, coating the edge. 5. Pour the strawberry, lemonade, and ice mixture into each glass. 6. Top each glass off by adding a splash of soda (or seltzer) water. 1. Place the watermelon, strawberries, and ice into a blender. Mix until combined. 2. Pour the mixture into a glass and top with the whip cream and blueberries. 3. Super easy – enjoy! 1. Combine all of the ingredients into a larch bunch bowl or pitcher. 3. Cover and refrigerate for at least four hours. 4. Serve chilled and make sure to get pieces of fruit in each glass. Newer PostBeat That 3 pm Slump With an Energy Boosting Banana!